THE SUPER BOWL WAS SUPPOSED TO BE THE DEFINING MOMENT FOR BILL BELICHICK. SADLY, IT WAS. It's time Bill Belichick grew up. We can joke about the hoodie. And we get the whole secrecy thing (even if we don't buy it) - that the less we share, the less our opponents know about us. And, for a while, his interview shtick was borderline comical: the way he would answer questions without ever answering them, leaving reporters and fans grasping for any sliver of insight into how he feels, how his players played, or what he thought of the other team. But there comes a time when even the best acts grow tiresome. Three words: Blue Man Group. Quirky, funny, bizarre when it started, now it's The Show That Won't Die; it's Cheers in Season 11. The only difference is that at least Blue Man and Cheers had their day and were entertaining for a time. 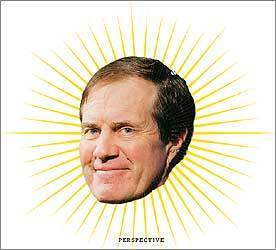 The only reason Boston sports fans have put up with Belichick's act is because he's won, not because they like him. But now it's been three years since his last championship, and, the Spygate scandal aside, his sourpuss act is starting to feel like the nauseating will-they-or-won't-they bedroom drama between Sam and Diane. Enough already. Go watch Doc Rivers stand outside the locker room after a hard Celtics loss and talk eloquently about Ray Allen's shooting struggles and Kevin Garnett's injury. Sure has hurt the Celtics this year having Rivers be so forthcoming. Or listen to Red Sox manager Terry Francona this spring rave about how excited he is about Jacoby Ellsbury or Clay Buchholz and about keeping Jason Varitek fresh for the long season. Too bad he keeps helping the Yankees with his reports; they certainly have capitalized the last few years with all that inside dope. Understandably, it's the one part of the job every coach or manager hates, especially after losing a game: having his decisions over-analyzed and second-guessed by every sports columnist, talk-radio loudmouth, and Joe from Quincy. But in this town, where sports falls right after breathing and right before food on the daily list of priorities, it's a part of the job every manager has to embrace. Here, the fans make the games, the fans drive the excitement level, the fans generate the buzz before and after each event. And those fans deserve better than "Well, we're disappointed," which is all Belichick could muster when asked by Fox's Chris Myers what he could tell his team after its shocking 17-14 Super Bowl loss. After the Red Sox blew their lead against the Yankees in Game Seven of the 2003 American League Championship Series and sent their fans home bleary and teary, Sox manager Grady Little had to do an obligatory interview for reporters on deadline. In his folksy, grandfatherly way, he explained why he did what he did with sincerity and in detail. "Pedro Martinez has been our man all year long, and in situations like that, he's the one we want on the mound over anybody we can bring in from that bullpen," Little said. "Pedro wanted to stay in there. He wanted to get the job done, just as he has many times for us all season long." Later, Little took the blame for the loss himself, saying, "I'm thankful that it's me instead of one of my players. . . . If we don't win the World Series, which is the definition of winning here, somebody's got to be that man, and I'm just glad it's me instead." Of course, fans and writers and sports-radio hosts ripped Little for not taking the ball from his ace, a decision that ultimately cost the manager his job. But nobody can say that when his team lost its biggest game in a devastating way that he didn't manage to handle himself with dignity and sportsmanship - pretty much the opposite of how Belichick handled himself after the Super Bowl, sprinting off the field with time still left on the clock, barely looking Myers in the eye during their postgame interview, never mentioning the Giants' tremendous play, and ignoring his own blunder to choose against kicking a field goal at a critical point in a low-scoring game. A lot of classy coaches have passed through Boston: K.C. Jones. Joe Morgan. Raymond Berry. But even with all his success, Belichick will never make that cut. Instead, he's going the way of Rick Pitino, John McNamara, and Bill Parcells. There has been talk lately of comparing the Patriots of this decade to the Yankees of the late 1990s, two teams that kept on winning and that fans around the country eventually turned on because they got tired of seeing the same team on top. But it's a flawed argument. The Yankees had Joe Torre leading them, as classy as they come and impossible to hate. The Patriots? Right now, a lot of football fans out there are happy New England lost the Super Bowl. And it's because of one guy. Doug Most is editor of the Globe Magazine. E-mail him at dmost@globe.com.